The acts of spontaneous creation and development associated with improvisational theater are clearly homologous with the ideals of jazz. 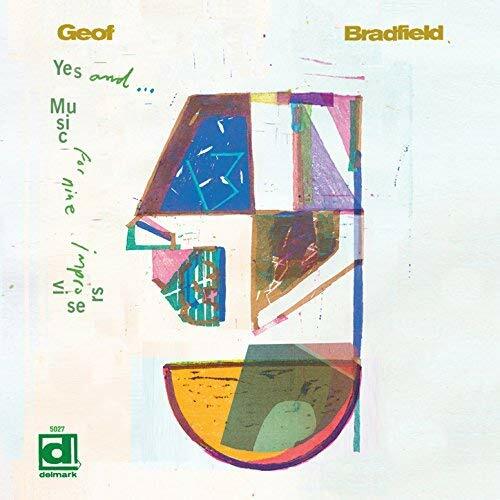 Sometimes it just takes a supremely creative spirit like saxophonist/composer Geof Bradfield to illuminate that fact. Alternating between numbers featuring different trio configurations and works for nonet, Yes, and … Music for Nine Improvisers highlights Bradfield’s arranging savvy while tapping into the pioneering improvisatory tactics of the Compass Players—specifically, that storied Chicago theater troupe’s adoption of famed director Viola Spolin’s “Yes, and…” game, requiring participants to accept and expand on another individual’s thought processes in off-the-cuff fashion. It’s this blend of the tightly choreographed and loose-knit that makes this such a compelling album. Bradfield’s brilliance in leveraging long-term friendships, writing for the individual rather than the instrument (à la Ellington), and knowing when to fill the canvas and where to leave space are apparent throughout. Whether forming an impellent force with bassist Clark Sommers and drummer Dana Hall on a rambunctious “Prelude,” using swing as a backdrop and creative thruster for “Impossible Charms,” or presenting a brass trio with somber suggestions in “Chorale,” Bradfield remains ever-cognizant of the various boundaries and links that, respectively, separate and bind structure and freedom. For every quickly passing thought—such as the prickly meeting of Sommers, Hall, and guitarist Scott Hesse on an “Ostinato” vignette or the sedate-turned-spooky reed read of “Chaconne”—there’s a more substantial offering waiting in the wings. Most notable of the bunch are the 14-minute “Anamneses,” a spellbinding odyssey showcasing singular talents like Anna Webber (on bass flute), and the album-closing “Forro Hermeto,” nodding to Brazilian icon Hermeto Pascoal in name and character. But in truth, every one of these performances shines while bathing in Bradfield’s syncretic light. Preview, buy or download Yes, and…Music for Nine Improvisers on Amazon!